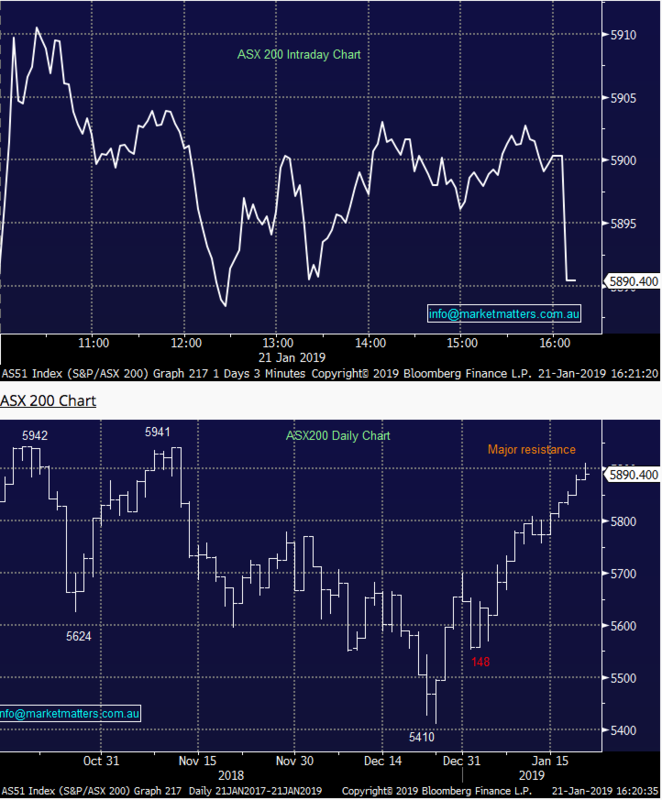 Some selling crept into the market today from early morning highs, particularly in the stocks that have led the recent advance from the December lows. Afterpay (ASX:APT) for instance rallied hard early before sellers locked in gains – the stock hitting a $16.97 high before closing at $15.25, a big +/-10% range for the day while Appen (ASX:APX),a stock we still own broke out from its trading range above ~$16.00 before closing back at $15.53, down -0.38% on the day. As one switch on client suggested today, CBA has been a big driver in the recent advance trading from below $66.00 to a $73.55 high today, although it closed down (-0.25%) on the session at $73.05. 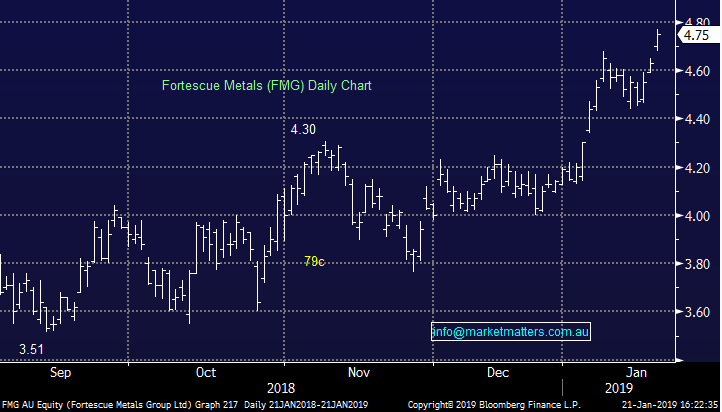 We’d targeted the 5950 region as major resistance and today the market traded to a 5911 high, before selling off fairly aggressively on the close in spite of a bullish lead from US markets on Friday. Asian markets were higher today while US Futures opened okay, before tracking lower throughout the session. No trade in the US tonight, closed for Martin Luther King Jr Day. Overall, the ASX 200 closed up +10points or +0.18% to 5890. Dow Futures are currently trading down -82pts or -0.33%. China Data; Lots of anticipation around todays data dump from China and it was pretty much inline – GDP smack on at 6.6% which was only a tad below prior number. Mkt initially rallied before selling off thereafter. Broker Moves; Some more bullish rhetoric coming out on Australian banks recently with analysts suggesting that Commonwealth Bank might buy back ~A$3.5b in FY20 or unveil an A$1.5b special dividend in FY19 before completing a A$2b buyback the following year after recent asset sales – however Morgan Stanley are on the other side of that trade saying that CBA shouldn’t trade at such a premium to the others –suggesting a ~20% premium is too high. 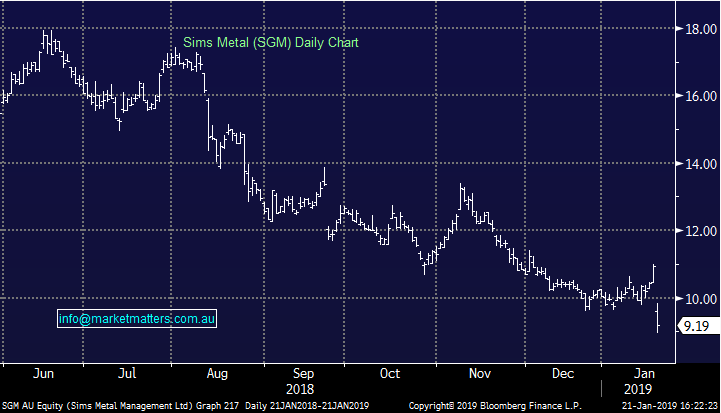 Sims Metal (ASX: SGM) $9.19 / -16.07%; Recycled metals company Sims Metal Management (ASX: SGM) has been whacked to new 2 year lows today on an earnings update the company released to the market this morning. The company announced expected EBIT for the first half of FY19 at around $110m which compares to a 1H18 figure of $125m or a 12.2% fall on the previous comparable period (pcp). Much of the soft result has been driven by poor European trading conditions which has resulted in an 88% fall in the company’s EBIT generation from the region. Potentially even more concerning for the company is not the poor trading for the 6 months just gone, but the outlook for the remainder of the year. Consensus EBIT for the 2019 Financial Year is currently at $271.6m, with current operating run rate landing at $220m for the year, this is -18% short of expectations. Over FY18, EBIT was split 45/55 first half vs second. If this trend continues, FY19 EBIT will be ~$244m, or still 10% short of the markets current forecast. The CEO & MD Alistair Field noted that “the first half has been challenging for all recycling companies globally and will continue to be so for the near future… I am confident that our strategy of producing high quality products that better meet the needs of our customers is key to our long term success.” Not a very promising outlook for the current shareholder. Consensus had EBIT growing at ~5.5% in FY20, and ~2.7% in FY21 which will be far too high if these trends continue. Stocks with weak earnings momentum are ones we will be looking to avoid in 2019.